This has been one busy week. I think most of my blog readers are friends on Facebook too ... so some of this might be a bit repetitive. I went to the doctor this week because I've been having a hard time walking on my left foot. The doctor diagnosed plantar faciiatis and a heel spur. He's prescribed an anti-inflammatory medication to help keep the swelling down. He also gave me a list of exercises I can do to help. Yesterday Griffin and I joined Mike in Chesapeake for an overnight stay. He's been working there for two weeks and it was fun staying at the hotel with him. After dinner we had a nice swim in the pool and then back to the room to relax and just be together. Mike is heading home tonight ... yaaaaaaa!! I've been adding more things to MY EBAY STORE ... like this cute Apple Basket Tear Bear! If you are interested in more information just click here to see it. We had so much fun putt-putt golfing the other day we decided to go back yesterday! We were joined by Hannah, Zachary, Sarah and Sam ... it was a beautiful day for a little putt-putt. My guy by his favorite hole ... the windmill! Love this picture of Carol. I'm very excited for the children at Griffin's preschool because Carol will begin teaching there this coming fall. She is such a patient, kind, loving person. She's loads of fun too! My mother-in-law emailed this to me and I thought it was worth sharing. 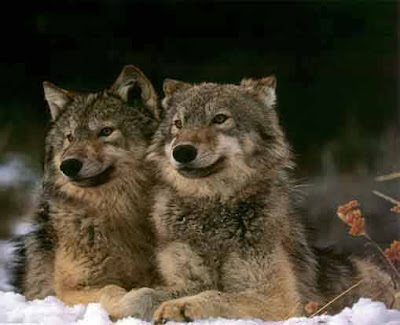 My son, the battle is between two wolves inside us all. It is joy, peace, love, hope, serenity, humility, kindness, benevolence, empathy, generosity, truth, compassion and faith. We found this Razor scooter at a yard sale a year ago. Griffin has played with it here and there, but since we have a gravel drive-way he can't really ride it. The past week, it's been all about the scooter. He doesn't really ride it. He pushes it. It's adorable. The other day we were walking down to the mailbox and he was "riding" his scooter. I told him next time we were up town we would see about getting him a new scooter. He said ... "But Mommy YOU got this for me, and it's new to me". That just warmed my heart ... he is such a SWEET, SWEET, SWEET boy. I have to remember that old saying ... one man's junk is another man's treasure ... or in this case ... one boy's junk is another boy's treasure. I'm still going to look for him a new scooter. I'm thinking one with three wheels on it would be better, the Razor only has two. We can take it to the park and he can ride around on the basketball court. Yes ... there's an idea! Pirate Golfing For Patrick's Birthday! Griffin was invited to his friend Patrick's 5th Birthday party ... for a little putt-putt golf! Griffin had never been putt-putt golfing before and he LOVED it! Daddy helping Griffin with the fine art of putt-putt golfing. Arrgggggh ... pirates can be cute! Patrick with the absolutely AMAZING birthday cake his Grandma made for him. A close up of the amazing birthday cake ... it was so detailed and she said it was only the second time she's made a theme cake! Jim, Kristen, Patrick and Matthew ... thank you for including us ... we had GREAT fun! Relaunching Sweet Paper Flowers Blog! I've decided to relaunch my Sweet Paper Flowers Blog. At Sweet Paper flowers you will find ... New Handmade Paper Piecings ... Lower Prices ... and even free shipping if you follow my blog! If you are interested in my handmade Teddy Bear Names, Teddy Bear Scallops and Sweet Paper Flowers CLICK HERE to see what it's all about! Well ... I've been bitten by the Facebook bug. I've been a member for awhile now but just lately have I really given it any attention. It amazes me the people that I haven't seen in years that friend me. It's kind of cool. I've reconnected with friends from my childhood, high school, work, current friends and even some wonderful customers that have become frieds. I'm so lucky. I'll be honest, a couple of people have friended me and I do not even remember them. So, I choose to not friend them back. I know they are from high school because I can click on their profile. But honest to goodness ... I can't remember! I'm a little embarrassed to say ... "hey can you send me a picture of what you looked like in high school so I know who you are" ... LOL. I see alot of people doing things like Farmville, YoVille, Sending Flowers/Chocolates/Seasonal Things ... but I just do not get into that. Well, not yet anyway. I love this networking community ... it feels my heart with joy to have this venue to communicate with friends. We went grocery shopping at Walmart yesterday and I saw this Minute Maid Light Lemonade on the shelf for only $1.00. I'm the only one in the house that will drink it and since it was only $1.00 I thought I would give it a try. It if officially my new favorite thing! It's a little bit tart and a little bit sweet. It's only 15 calories per serving and it is delicious! I'm definitely keeping this in my refrigerator as a "Mommy Treat". If you enjoy lemonade ... give it a try! This past weekend it was time to add some paint to the porch frame. Isn't this going to be one awesome porch? Living in Florida we always had a porch to enjoy. During the spring and summer we would eat quite a few meals out there. I can hardly wait to be able to do that with our porch! We had a huge task of trimming out the boards around the front and edges. We wanted to trim them by hand so we wouldn't get paint on the brick. Here's my handsome husband hard at work painting. And our handsome boy was quite the big helper as well. Notice how I painted lines where I wanted him to paint between. Tee Hee. Griffin did do a good job of helping out ... however ... he got bored with it. I brought his paints outside so he could paint with his colors. He loved painting outside. Of course I got in on the action as well. I helped paint the trim. Then I decided it was time to paint Griffin. It all started with the little circle around his belly button ... it escalated from there. Even working together makes fun family time! And now ... we have picture proof! Griffin got the movie Bolt on Saturday ... we've watched it about 4 times since then. My neighbors have a new litter of Great Pyreenes puppies ... we visited with them last week. I have to tell you ... I am majorly fighting the urge to go down and adopt one. We had the pleasure of going to Kings Dominion Amusement Park with our friends Heidi, Ryan and Evan. It was our first visit and we had a fantastic day! Kings Dominion is actually two parks in one. It's an amusement park with rides and characters from Nickolodean such as Dora the Explorer, Sponge Bob Square Pants (ick!) and even Scooby Doo. There is also 20 acre water park too. We first enjoyed the ride side and then we ended up over at the water park. I have zero pictures of the water park because we put our purses in a locker so we could enjoy the water without worrying about our belongings. 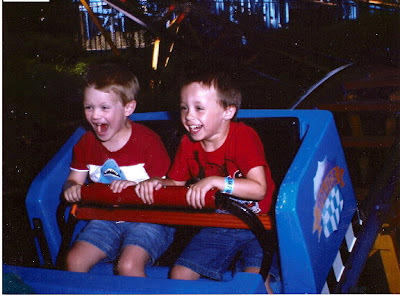 Look at the smiles on Ryan and Griffin faces as they ride the roller coaster ... this was the theme of the day. Lots of fun, smiles, giggles and laughter! The boys enjoyed riding these little cars ... and they were very good about obeying the traffic rules. Griffin on the same ride ... of course he chose the helicopter! I just had to share this ... the food was SO expensive in the park. We were lucky enough to get food inside (peanut butter, bread, chips, grapes, apples, etc). They didn't even look in that bag! Water was $3.75 a BOTTLE! As we were eating our food I was teasing Heidi we were going to get in trouble for having contraband food in the park. The swings ... the boys were BORED to death with this ride. Can you see Ryan asking the lady if she could make it go faster? Our sweet boys all lined up, waiting patiently to ride the bumper cars. Bump, Bump .... Crash ... on the bumper cars. But before we headed home ... the boys were SO good, they earned a special "laser" toy on the way out. We are ready for an adventure! Nature Walk To The Mailbox. Griffin and I often take a walk to the end of our road to check the mail. We live about 1/4 mile away from our mailbox and it's a nice little nature walk for us. And look ... we also saw some wild blackberries growing. Griffin decided he wanted to pick some "flowers" to put in water when we got home. Making our way to the mailbox ... flowers in hand. Finally ... a full face picture of Griffin ... with a smile on his face. Lately he was been very opposed to my picture taking. How about this beautiful flower arrangement? This is my favorite kind of flower bouquet.